These images, taken with the ONC-T (Optical Navigation Camera – Telescopic) instrument at ranges from 330 to 240 km as the spacecraft approaches the asteroid, show that Ryugu is spinning like a top, completing one revolution every 7.6 hours. First off, the happy news! Soyuz MS-02 launched successfully from Baikonur Cosmodrome yesterday. Aboard were Sergey Ryzhikov, Andrei Borisenko, and Shane Kimbrough. The mission was delayed a month due to technical issues with the spacecraft, but the repaired vehicle is performing well. They will arrive at the ISS tomorrow; the longer two-day approach was selected to allow more opportunity to test the new Soyuz MS series. And now the less happy news: ESA has analyzed the data from the Schiaparelli lander, and although they still do not know what happened exactly, they have a better picture and it isn’t good. The only data they have comes from monitoring of its telemetry during descent. The entry sequence was nominal through atmospheric entry and parachute deploy, but then events started to deviate. The signal indicating parachute and backshell jettison came early, and then the engines ignited and the descent radar was switched on. However, they only appear to have burned for 3-4 seconds, and it isn’t clear whether all nine engines fired, nor what altitude the probe was actually at. They were expecting the engines to fire for about 30 seconds. At this point, they do not know whether backshell jettison was too high, or whether something caused a false indication of landing leading to premature engine cutoff (which is what killed Mars Polar Lander), or whether it actually came in much lower than expected, leading to it hitting the ground just a few second after ignition. They actually got about 600 MB of data during the descent, so they have a lot more data to look at. But although ESA hasn’t completely given up, it really looks like the lander is dead. Hopefully the second lander, in two years, will have better fortune; Mars is difficult, extremely difficult, but it rewards persistence. ExoMars update: TGO is in orbit around Mars! Schiaparelli — we don’t know. First off, a bit of good news: ESA’s Trace Gas Orbiter (the first major element of the ExoMars program) has successfully entered orbit around the planet Mars! It joins the existing fleet of Martian orbiters, including ESA’s Mars Express, NASA’s Mars Odyssey 2001, Mars Reconnaissance Orbiter, and MAVEN, and India’s Mangalyaan-1 (or Mars Orbiter Mission). This puts a record-breaking six active spacecraft around Mars. Unfortunately, the news is less cheerful for the Schiaparelli lander that was hitching a piggyback ride to Mars atop TGO. A direct beam to Earth was observed on an experimental basis by an Indian radio telescope; the signal indicated successful backshell release, parachute deploy, and heat shield separation, but cut off abruptly moments before touchdown was expected. Mars Express had been listening to the lander as well, and after completing an orbit it was able to relay what it had received — unfortunately, it received exactly the same thing. Schiaparelli was scheduled to contact Mars Reconnaissance Orbiter half an hour after landing, but MRO received no signal, on that or its next pass over the landing site. At this point, the fate of Schiaparelli is unknown. Mars has eaten a lot of landers through the years. It is significantly more difficult to land on Mars than on other worlds, and the extreme speed of entry from solar orbit means there is a hell of a lot of energy to cope with if anything is even slightly misjudged. At this point, I have to say it doesn’t look good for Schiaparelli. But the good news is that TGO, the larger and more significant portion of the project, is in good health! ESA will learn from this, and be ready for the much more ambitious rover mission planned for the second half of the ExoMars program, scheduled for launched in 2018. 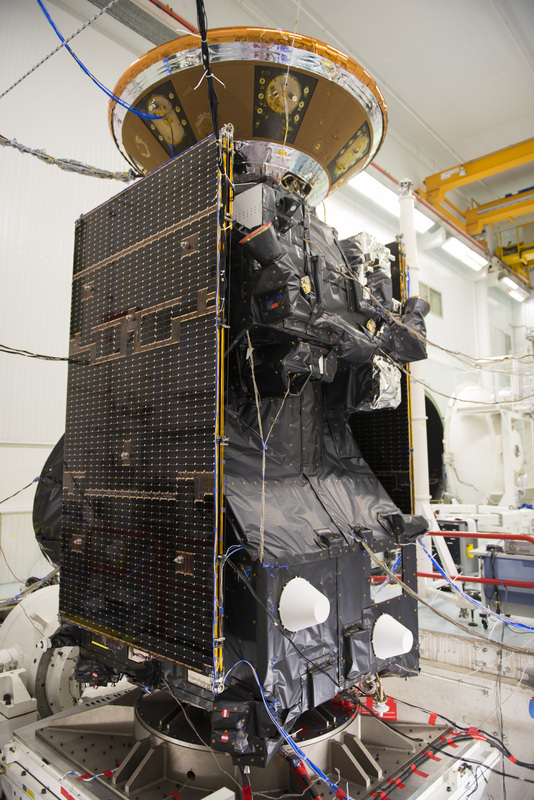 TGO and Schiaparelli prepare for vibration testing in their launch configuration. TGO’s solar arrays are tightly folded, and the cone at the top is Schiaparelli’s descent module. Antares has returned to flight, and Schiaparelli has been released! Two exciting moments in spaceflight today! First off, the much-anticipated return to flight for Antares, launching from Wallops Island in Virginia and delivering the Cygnus “SS Alan Poindexter” on the OA-5 mission to the International Space Station. Alan Poindexter has since deployed its circular solar arrays, a lightweight design making its third flight on this mission, and is making its way towards the ISS. Capture and berthing is expected Sunday. Antares had a spectacular failure on its last flight, using 1960s legacy NK-33 engines. The new Antares has brand new RD-181 engines from NPO Energomash in Russia on its first stage; the first stage tankage and plumbing, meanwhile, are still built by the Ukrainian company Yuzhnoye, while the upper stage is a Castor-30 solid fuel rocket built in house by Orbital ATK. Cygnus OA-5 is named for Alan Poindexter. Orbital has established a tradition of naming their cargo vessels for deceased astronauts. Poindexter was an accomplished naval aviator and test pilot, who after joining the astronaut corps went on to make two missions into space aboard the Space Shuttle. Upon retiring from the astronaut corps, he returned to the Navy as an educator. However, he tragically died just two years later at the age of 50 in a boating accident. Meanwhile, millions of miles away, the ExoMars Trace Gas Orbiter has released the Schiaparelli lander. This is ESA’s first attempt to land on the red planet. (Beagle 2, which piggybacked on Mars Express, was a purely British enterprise.) The Trace Gas Orbiter then performed a Mars avoidance maneuver; at the time of release, it was on a Mars collision course, which was necessary in order for the lander to end up on the right trajectory. TGO will enter Mars orbit in two days, while Schiaparelli will be entering the atmosphere the same day — there will be some very tense controllers in Darmstadt for sure. ExoMars is a European-Russian joint program that actually spans two missions — this one, launched by the Russians in exchange for carrying some Russian instruments originally designed for the Phobos-Grunt mission, and a second one in 2018 that will feature a rover. It’s an ambitious move in Europe’s planetary program; cross your fingers for them! The Philae lander has been found! The Philae lander, lost shortly after touchdown on the Comet 67P Churyumov/Gerasimenko, has been found. ESA mission controllers had been able to broadly narrow down its location, but until now have been unable to find the lander itself because Rosetta has been too far away to take pictures of sufficient resolution. As of last Friday, that is no longer the case. Now entering the final phase of its mission, Rosetta is making much closer passes by the comet’s nucleus, and it has now returned an image in which the lander is clearly visible. It’s now obvious why the lander was unable to right itself: it is firmly wedged into a crevice, on its side, under a large overhang. There is no hope of reviving the lander; it simply cannot receive enough sunlight in this orientation, ever. By the end of the month, Rosetta will have joined it on the comet’s surface, after slowly spiraling in and photographing ever closer. Scientists may manage to land Rosetta more delicately, repeating the feat of NEAR-Shoemaker in landing on 433 Eros. But at that point the primary mission will, most certainly, be over.